Wikis were one of the first Web 2.0 tools to take off within schools. It makes sense – they’re perfect collaborative tools, they’re easy to use, and they’re FREE to create. Just Google “education wiki” to see how pervasive they are in today’s classroom. to provide some suggestions and examples of steps to take your classroom wiki to the next level. After reading, if you’ve got additional suggestions or wiki examples, please leave a comment! If you (or your students) would like some more wiki basics, check out this TeachersFirst page. Wikis are the perfect constructivist teaching tool. In the past, teachers who created Web sites remained the source of knowledge — the sage on the stage, even in the cyber world. Wikis, however, allow teachers to become the guides on the side as their students create, edit, and collaborate on class assignments. High school science teacher Louise Maine even says that a classroom wiki made her a better teacher. It was the spark that turned her teacher-centered classroom into a student-centered one. Most commonly, wikis are used as collaborative tools. Teachers have students work together on group projects, using the wiki as their shared space. Wikis were built for this. One student can start a paper, and another can jump on and finish it. Or edit the first student’s work. The two can go back and forth like this, even if they’re both in their respective homes. If they’d like to talk about something as they edit, there’s a discussion page apart from their workspace. (Some teachers even add live chat widgets to their class wikis.) Plus, a history of all the changes is saved, so students can go back to an earlier version, and teachers can compare versions to see exactly which student did what. This is a great use of wikis, but a lot of teachers stop here. My question is: if the Internet is global, why stop collaboration at your classroom door? The Horizon Project takes wikis to the next level. It’s a collaborative technology project between five high school classrooms in five different countries. Rather than working with their in-class peers, students work on projects with teens halfway around the world. At the aquarium where I work, we co-teach a high school environmental science class. In this class, students work in groups of about four on a year-long project. They gather and analyze scientific data from the wetlands and coasts in the area. For years, we’ve partnered each group with a mentor scientist. The working scientists volunteer to help students through the year-long process. The program has been a great success for years, but one of the biggest hurdles has been coordinating meetings between student groups and their mentors. It’s difficult for mentors to regularly make it to class, so often they’d arrive to find students had taken a wrong turn weeks earlier, but they hadn’t caught it. Wikis can open your classroom to local professionals, many of whom are more than willing to lend a hand, though they can’t take the time in the middle of the work week to visit your classroom. Wiki collaboration can open a lot of doors for students, but why let them have all the fun? Teachers can use wikis to create lesson and unit plans with peers in different schools, cities, states, or countries. Think about it — how often have you met an amazing teacher at a conference who you then never spoke to again? Why not create a wiki page to continue your work after you fly back home? Even within a single school, teachers sometimes don’t have the common preps they need to effectively plan. This wiki is used within a single school for Pre-K teachers to create long-term plans. Many teachers have students collaborate on a wiki for a group project. This is great, but often, all the student groups are working on the same assignment. With wikis, though, student groups can jigsaw more effectively. Teachers can assign each student group to research a different aspect of a topic, and then publish their findings on the wiki. In just a few weeks, a class could have written what is in essence the chapter of a textbook. Students can access other groups’ work for homework and to study, and they can have discussions about the information on the wiki’s discussion pages. After a year, a single class could have written its own textbook — an act that takes learning much deeper than simply reading a textbook could have done. This wiki, by a high school history class, even organizes its wiki pages into units (check out the links on the left). The class dictionary was my weapon of choice when I used wikis with fourth graders a few years back. I taught English-language learners, and academic vocabulary was an integral part of my curriculum. But, like many teachers, I struggled to make the vocabulary meaningful for my students. 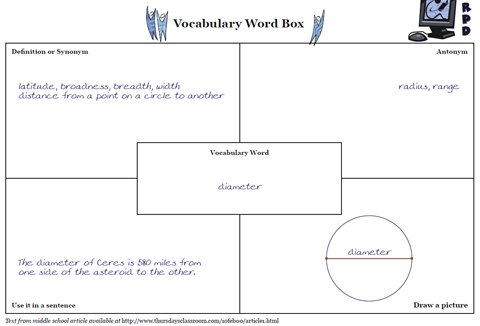 Each week for homework, students would complete vocabulary word maps for the new words we learned. However, to ensure understanding, I had students write definitions in their own words. Because of this, I had to check students’ work and give feedback — something that was extremely time-consuming. So I decided to start a classroom dictionary. I set up a wiki, and used it as a center. Students would rotate through it daily, adding three or four words (in alphabetical order), or editing another students’ work. The idea was that, through the wiki, students could correct one anothers’ misconceptions. Although the wiki worked well, it pretty much just served as a place to store our vocabulary words. I didn’t do a good job of teaching students to use it as a resource. If I were to do it again, I’d encourage students to head to the computer at the back of the classroom to refer to the wiki throughout the school day. I’d also spend more time sharing the wiki with parents, so they could encourage students to use their vocabulary words when speaking at home. Plus, it would have made a great resource when students were studying or completing homework. It would have been great to have students create screencasts or cartoons about a single word or using as many words as possible. They could have then published their projects on the wiki. By year’s end, my students had created their own classroom dictionary. It would have been the perfect place to start a year-end debriefing discussion about all the things we’d learned. Language arts teachers often have students present book talks after reading a book. Classroom Book Talk has students publish these talks, using VoiceThread, on a wiki. It’s a wonderful way for students to share books with one another in a fun, interactive way. However, I’d suggest taking literacy wikis a little further. At every school where I’ve taught, leveled reading groups have been the center of reading instruction. These worked well, but I always thought it would be great to turn the reading groups into something more like book clubs, especially for higher-level readers who no longer needed much phonics instruction. It would be wonderful if students, with guidance, could choose their own books and lead their own discussions about them. However, I never had enough time to teach students my expectations for book clubs and, since my time was often monopolized by lower-level reading groups, I certainly didn’t have the time to observe students during these clubs. Wikis offer a good chance to implement book clubs in the classroom, though. Before school, teachers can post a few guiding questions or thoughts. Then, students could either meet in person, meet only via the wiki, or both. No matter how they meet, they should be expected to be active on the wiki’s discussion board, as well as on the wiki itself. And after school, teachers can check up on students’ work, without having to take precious in-class time. For some more ideas — and reasons to use wikis in the classroom — check out 50 ways to use a wiki. *Both sites offer additional features, if you pay a fee to upgrade your account. I really like the robustness of PB Works, but I point less tech-savvy teachers toward Wikispaces because it’s a bit more user-friendly. Wikispaces also has some good tutorial videos for wiki beginners. Objective: The student will be able to compare and contrast different parts of the world. Teachers of younger students might assume that wikis aren’t a tool they can use in their classroom because their students aren’t writing enough to create their own content. However, the beauty of wikis is that anyone can edit them — not just your students. In fact, done well, wikis give students a chance to interact with the world. With a wiki, a student has the power to ask a question and gather answers from around the globe. One first/second grade class created a wiki to find out what 1,000 looked like. More than a thousand people from around the world added their names to the blog, so students could see a list of 1,000 names. Wikis open the world up to students, which is perfect for kids studying geography. For example, with the help of her dad, a third-grader started Abby’s Travel Logue wiki to help with a school project. At school, Abby created a journal that she mailed to people in other cities, asking them about where they live. As she sent the journal off in the snail mail, her dad helped her start a wiki asking readers to answer the same questions, but post their answers on the wiki. The response was so astounding, they had to start a second page to hold all the information. Objective: The student will be able to understand how people in various professions impact the world, and they will understand what’s required to do those jobs. Career Day can be a really exciting time for students, especially in low-income schools, where students might not have many opportunities to talk to college-educated professionals. It gives students a chance to interact with local professionals, and ask questions to help them make important life decisions. But, too often, Career Day isn’t as productive as it could be. First off, it’s only one day, which isn’t always enough time for students to fully understand every profession. Secondly, you’re limited to the people who are able to come to your specific school on that particular day. Lastly, there’s rarely time for more than a canned (often boring) presentation from most professionals. Wikis, on the other hand, give your students the opportunity to have more meaningful interactions with mentors. Your class could create a wiki and decide how they’d like to organize it (i.e., careers that require a 2-year degree, a 4-year degree, etc. OR careers that focus in math, social studies, science, etc.). Students could populate the wiki with a few basic questions — what’s the best part of your job? The worst part? How much money do you make? Etc. Then, you could invite professionals (the same ones you’d ask to Career Day, plus those in other parts of the world) to post their replies. After reading the replies, students could post follow-up questions about the careers that most interest them. The professionals could probably offer some tips on what students could do now to prepare (attend a marine biology camp, start a robotics club, etc.). If students are particularly excited about a few careers (or some align with your standards well), perhaps you could set up field trips based on these careers (i.e., to a local hospital to learn more about cardiologists). Or maybe you could help your students inquire about internship opportunities in the fields that interest them. You might still decide to host a Career Day after these interactions, and it will probably be a more meaningful day, filled with much more in-depth questions from your students. I think you overestimate how many are already using wikis. I had not thought of this and want to give it a try. In honor of Teacher Appreciation Week, boojeebeads.com is having a contest where every teacher in your school can win a free gift! Check out the contest at my link.